Tarp Supply offers a huge selection of top quality tarps and accessories competitively priced to give you the best value for your money. Customers who shop around turn to us for our offer the first time; and they return to us again and again for our consistent delivery of value each time. You can conveniently order online or call us at 1-630-953-4700. Our helpful customer service representatives are standing by to serve you. Got tarp questions? Please check out our tarps introduction below and more information on our Learn page. Tarps are among the most versatile and practical tools used today. Whether it is in the backyard, on the road, in the workshop, or on a camping trip, you will spot tarps utilized by people of all trades and hobbies. Tarps are useful in many applications both indoors and outdoors, including construction, landscaping, painting, covering valuables, building your own ice rink and everything in between. As tarps come in various types with different qualities, finding the right tarp for your needs is important. Polyethylene, Poly for short, tarps are extremely versatile and can be used both indoors and outdoors. These tarps are water resistant (some waterproof), wind resistant, and rot and mildew resistant. The heavy duty plastic-like texture of poly tarps allows them to be more 'wrap-able' relative to the other tarps. For more information and popular uses, please see our Poly Tarps page. Canvas tarps are generally made from cotton or polyester and have a more rugged feel (both look and touch) to them. Treated canvas tarps are water-resistant but not waterproof, allowing them to be breathable and thus reduce condensation build-up underneath. Treated canvas tarps are also rot and mildew resistant from silicon chemical treatment and are recommended for outdoor use as they contain a slight odor and may leave stains. Tarp Supply also offers untreated, all natural canvas tarps that are most eco-friendly. For more information and popular uses, please our see Canvas Tarps page. Also known as shade tarps or privacy screen tarps, mesh tarps are used by public facilities and private homes as a screen cover for their fences. 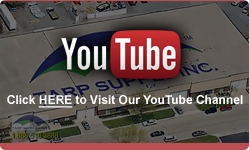 For more information and popular uses, please see our Mesh Tarps page. As their name imply, fire retardant tarps shield against heat and flames. Flame retardant tarps are not Fireproof tarps. If brought to direct contact with fire or flames, the tarps will burn. Unless specifically noted, you should not expect a tarp to be fire retardant. Fire retardant tarps are available in poly, vinyl, and canvas. Please our see Flame Retardant Tarps page for more information on these different types of fire retardant tarps. Tarp Supply brings you specialty tarps specifically designed and made for applications such as hay tarps, athletic field covers, pool covers, martial arts floor covers, roofer's tarps, and many more. Use our left hand navigation or type in what you are looking for in the search bar. If you don't find what you need, please call or email us. 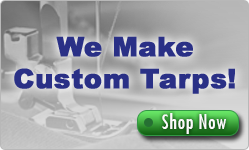 We can make just about all kinds of custom tarps to your specifications. For more information, please refer to our Learn page.